For people, the most common method of ingestion is to drop a few drops of CBD oil directly underneath the tongue. For dogs, this is usually not a workable method. Therefore, a good alternative is to drop a fixed number of drops on the dog food. Make sure your dog eats everything, because you want to be sure that your dog gets all of the CBD oil. An innovative product was recently launched in North America: dog food with CBD in it. That way, you are always sure that your dog gets enough CBD. Dog food with CBD is not yet available in Europe. When that changes in the future, it is very likely that we will include dog food with CBD in our range. Tip! Make your own CBD dog food. With every CBD oil, we indicate how many mg of CBD 1 drop contains. That way, you know much many mg of CBD your dog gets. Sprinkle the CBD drops over the dog food and lo and behold: CBD dog food is a fact. The main difference with CBD oil for people is that CBD oil for pets uses lower concentrations of CBD. 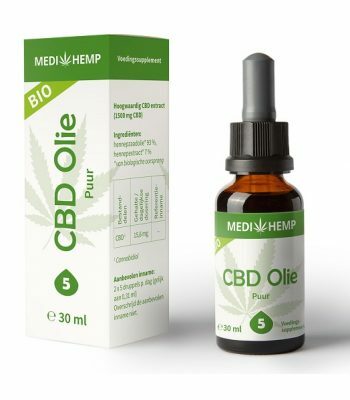 In addition, CBD oil for people is usually diluted with hemp seed oil. CBD oil for animals is usually diluted with fish oil (salmon oil). The dosage of CBD oil can differ per dog. Furthermore, the CBD concentration determines the number of drops you can give your dog. You can use the following guideline to determine the dosage: For every serving, 1 drop of CBD oil per 5 kg of body weight. Maximum 3 servings per day.